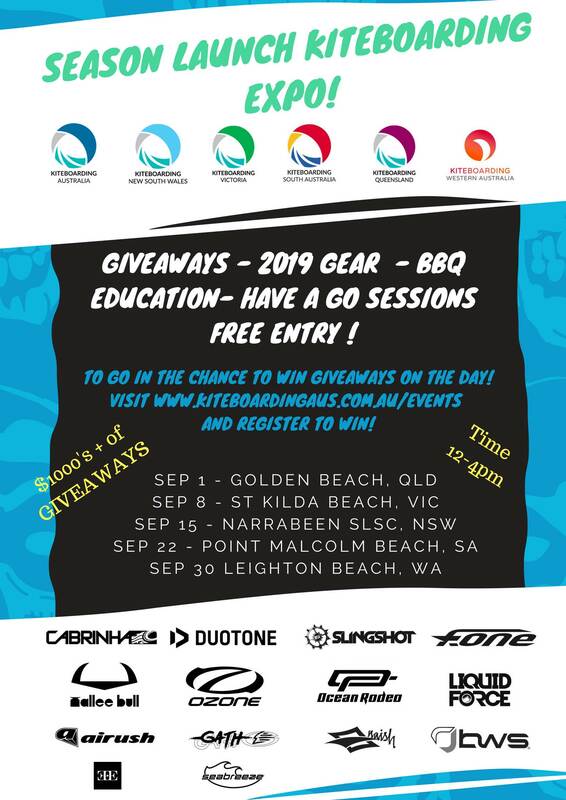 The new season is coming fast and Kiteboarding Australia with our State Assocations are kicking off season 2018-19 with a series of Season Launch Kiteboarding Expo's visiting every state this September. We are stoked to be partnering with the kiteboarding industry to bring all the later gear, tips & tricks to a beach near you. There is no cost, everyone is welcome and everyone will have the chance to participate in a range of amazing giveaways and activities thanks to our partner brands. New kiteboarders are encouraged to visit the expo's, this is a great opportunity to have a go of flying a trainer kite for the first time and meet the right people to get you involved in our great sport. The BBQ will be fired so come down to your local beach to join the community for the official season launch.